The Third Floor of Old Main contained two classrooms, two laboratories, and a tiered floor lecture hall. One chemical laboratory and one physical laboratory accounted for the two labs on the 3rd floor. A storage room accompanied each laboratory containing materials needed for the classes offered there. The lecture hall was characterized by tiered seating as well as a skylight situated in the center of the ceiling. 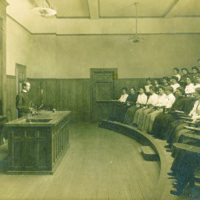 The Assembly Hall’s upper section was located across from the lecture hall and offered windows overlooking the assembly hall.